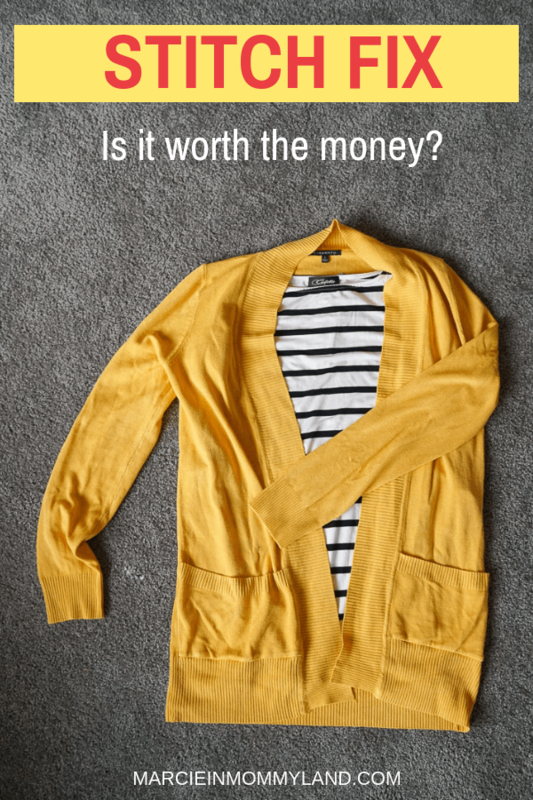 If you’ve found this Stitch Fix review post, chances are you’re wondering how Stitch Fix works and whether it’s worth paying for. 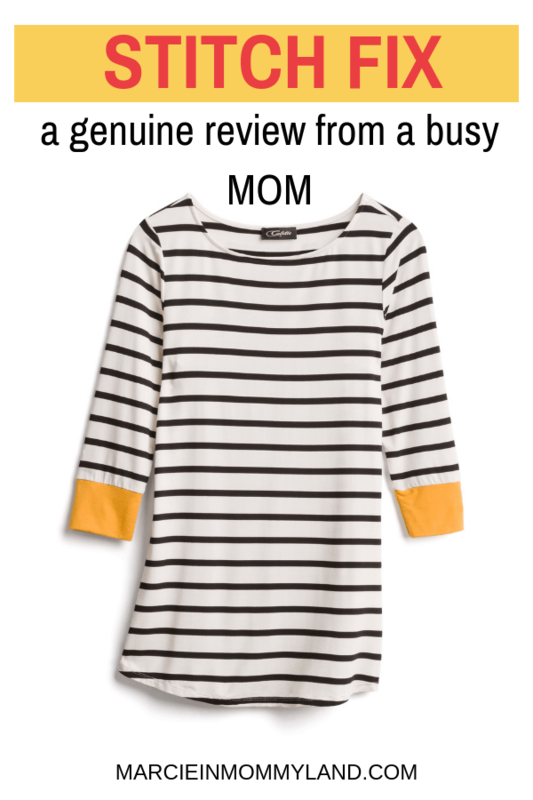 Get these questions answered in my candid Stitch Fix review. So, last week I had the opportunity to attend a Seattle blogging conference. I was able to line up a sitter for my kids and I was stoked to get 8 hours of kid-free time where I could focus on learning how to grow Marcie in Mommyland while getting to know other people in my field. One of my goals for 2018 has been to transition my blog from a “just for fun” project into a thriving small business. I left my career in nonprofit development when I got pregnant with my oldest more than 5 years ago and through the years, I’ve donated most of my professional wardrobe. Since I’m mostly at home with my toddler and preschooler, I tend to wear a lot of yoga pants, sweatshirts, and clothing from Costco. If I’m really getting fancy, I’ll add a pair of jeans to the mix. When I need to dress up, I have a grey sweater I’ll throw on and that makes me feel a bit put together. So, as I was getting ready for my conference, I started combing my closet for the sweater. That’s when I remembered that I wore it recently to another event and it must be in the laundry. I forgot to mention that my sweater is wool. When I (horrifyingly) found it in the dryer, it looked like it would fit my 4 year old! Yikes! It was in that moment that I realized this one unfortunate incident shouldn’t have thrown me for such a loop. I needed more than one “nice” option. That’s why I signed up for Stitch Fix. 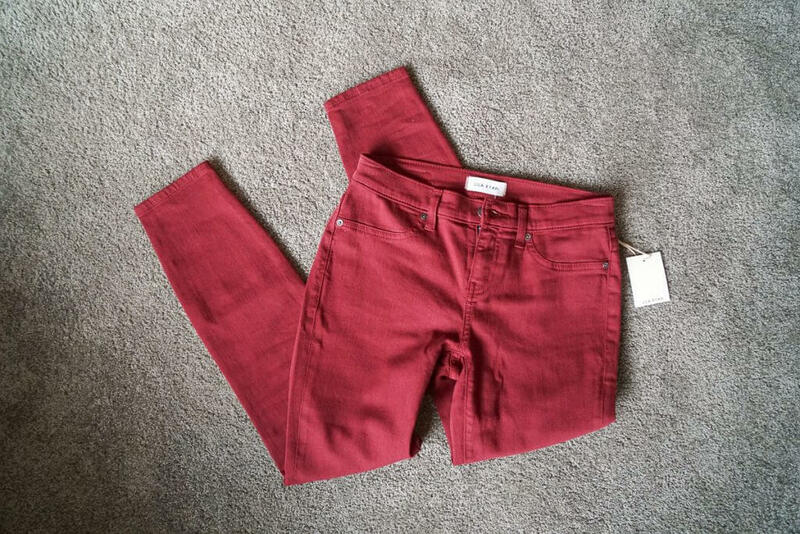 It was actually another Seattle blogger, Jen from Thrifty NW Mom, who encouraged me to try out Stitch Fix. I know a few Moms who have tried it out when heading back to work after maternity leave and it was such a stress reliever for them. But, since I don’t work outside the home, I assumed it wasn’t meant for me. That couldn’t be further from the truth, though! And they have expanded to include men and kids! They also have subscription boxes for men and I think that’s such a brilliant idea! One of our friends lives in D.C. and I remember him telling me that he loves doing these kind of subscription boxes because someone else is picking out things they think will look good on him and he doesn’t have to spend a day trying on a million things. For him, it’s all about outsourcing and that’s the big perk! Another cool program they have is a kid-version of Stitch Fix. They have items for boys and girls sizes 2T–14. Each box includes 8–12 unique pieces and it’s an awesome way to shop for your kids without dragging them to the store! 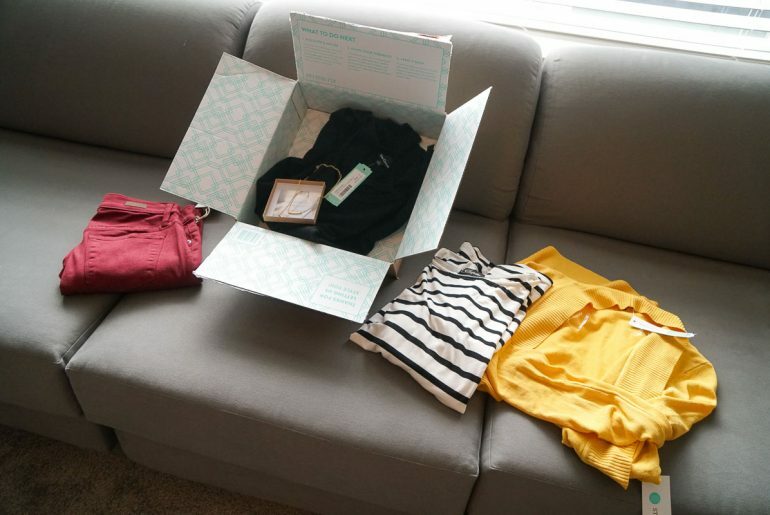 I also have to mention that Stitch Fix has a maternity box available. 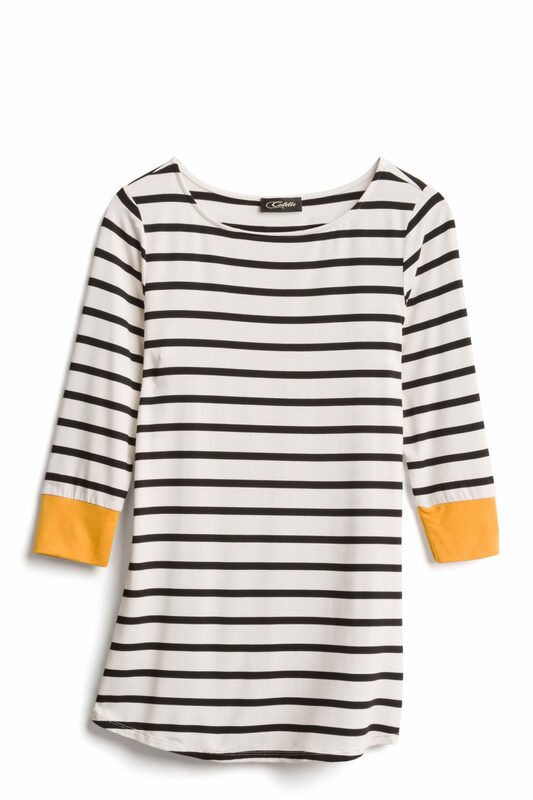 I think this is so smart because it can be difficult to find maternity clothing that fits but is also cute. This is an easy way to get stylish maternity clothes sent to your house with minimal effort. And it’s not just for first time moms! When I was pregnant with my youngest, I was surprised (and disappointed) that some of the clothes I bought when I was pregnant with my oldest were all stretched out and looked really sloppy when I tried them on. It made me feel a bit stressed when I need to “look nice” and nothing I had made me feel put together. 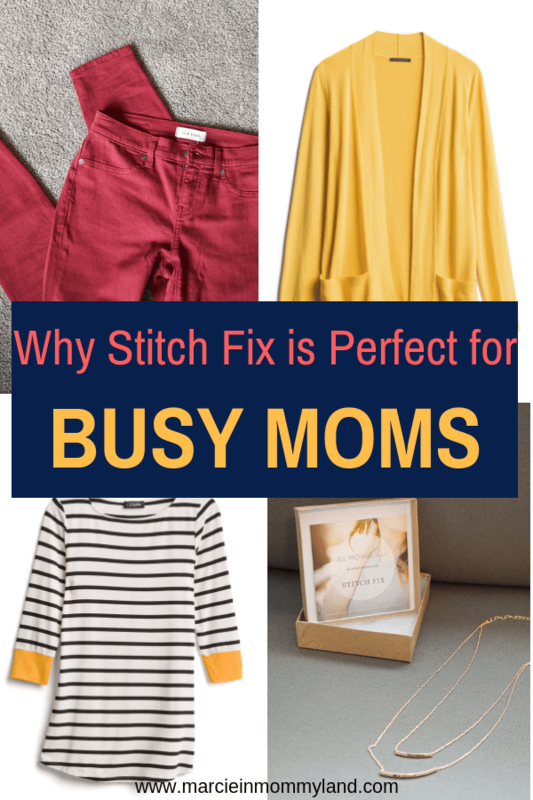 I wish I would have signed up for Stitch Fix then so I would at least have had some maternity options. Head to Stitch Fix and sign up for an account. They will ask you a lot of questions about your sizes and style and what types of clothing you like or don’t like. I really like how they ask which areas you like to flaunt and which areas you’d rather have looser clothing! You can select which type of items you want in your box as well as ones you don’t. I specifically requested shirts, sweaters and cardigans. And I made sure they didn’t send me any shorts, earrings, scarves, or shoes. 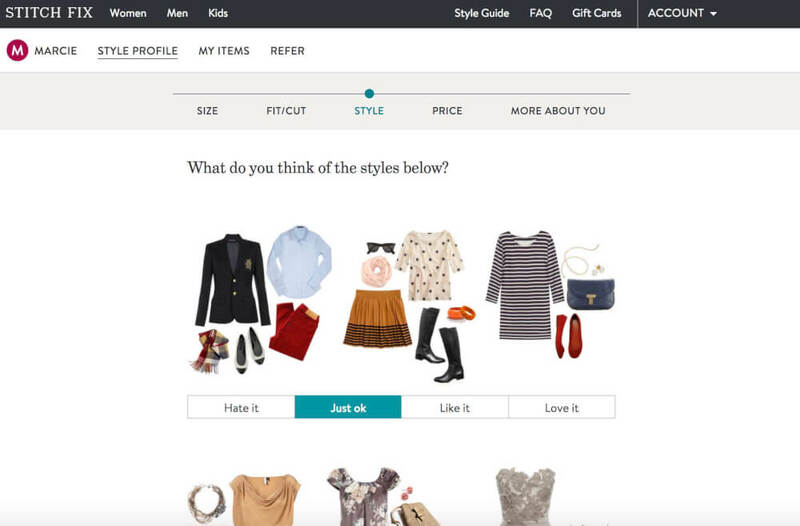 When you log into your account, you can click thumbs up or thumbs down on a carousel of clothing options. This information is sent directly to your stylist so he/she gets a better sense of what you like. These pieces change everyday, so I highly encourage you to log on everyday and narrow down your style. I do this while I eat lunch and it’s like a mini shopping spree! Then, you wait for your Stitch Fix box to arrive. Once it arrives, you have 3 days to try everything on and decide which items you love and want to keep. Then, put the rest back in the box and ship it back to Stitch Fix. I love shopping. Like, that’s always my preferred activity. It’s how I relax and I just enjoy the entire experience of looking for something that brings me joy and makes me feel great! However, shopping with my little boys is one of the most stressful experiences. My oldest is too big for the stroller and so he ends up wandering around telling me how bored he is. And when I try to just go with my toddler, he ends up touching every item of clothing and trying to pull it off the hanger. I spend most of my time trying to make sure we don’t leave the store a wreck. And don’t get me started on trying on clothes in the dressing room with two little kids who want to crawl underneath the door and see who’s next door! So, I love that Stitch Fix mails a curated box to my house where I can hide away in my bedroom and have my own personal shopping experience. I get the excitement of discovering new items, the satisfaction of being able to feel the fabric, and the bonus of trying them on in my own house. It’s so helpful to be able to bring the Stitch Fix clothes into my closet to see how they work with pieces I already own. 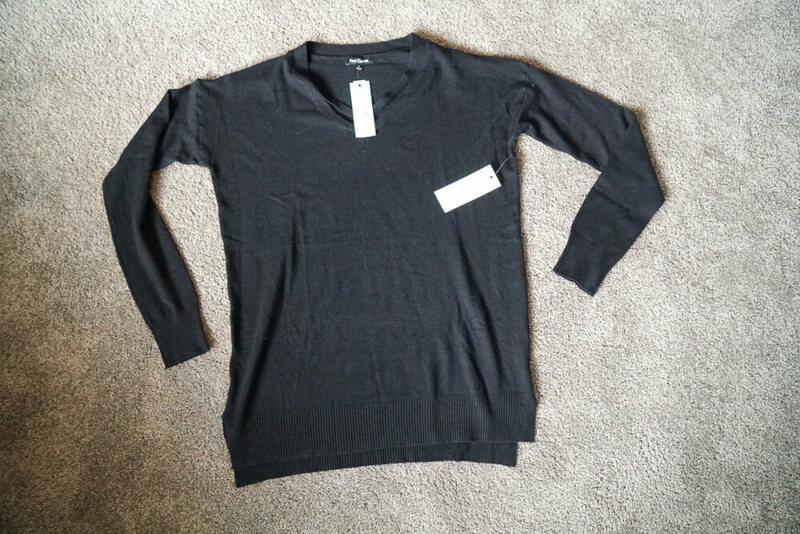 Stitch Fix Review: What Was in My Stitch Fix Box? When my box arrived, I was surprised it was smaller than boxes I’d seen in other Stitch Fix unboxing videos. However, I remembered that I specifically said I didn’t want shoes, which take up a lot of space! 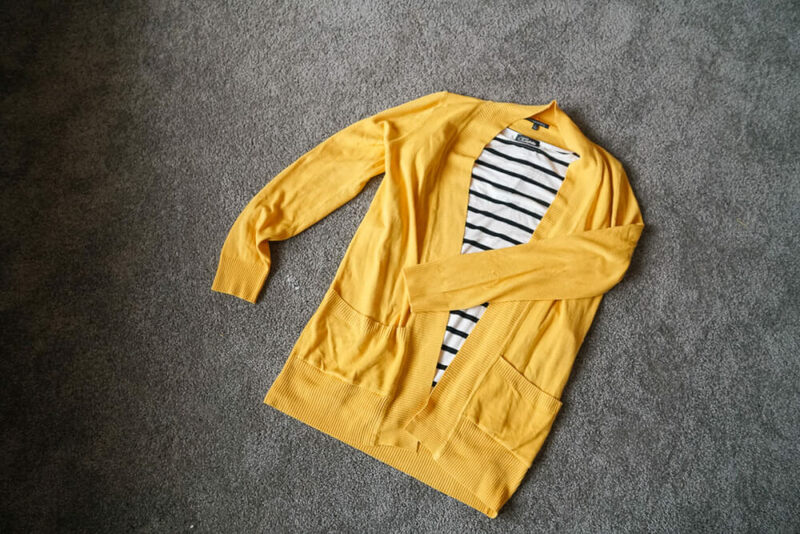 The first thing I pulled out was this gorgeous mustard yellow cardigan! I’ve been wanting to add a pop of yellow into my wardrobe, but I haven’t been able to find the right piece. This was a total win in my book! It’s like my stylist read my mind! 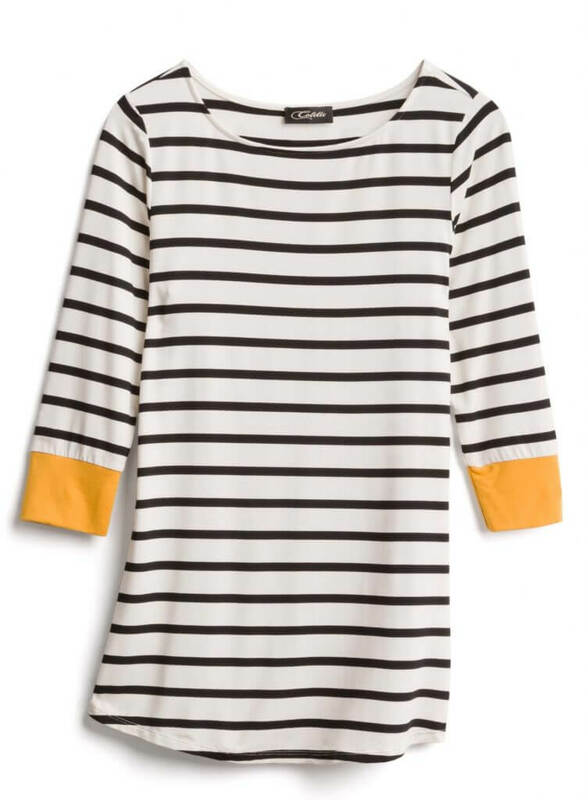 The next thing was this black and white striped shirt with a pop of the same mustard yellow on the cuffs. Again, totally something I’d like to add to my wardrobe! This black sweater felt so soft and cozy, yet it could be dressed up or down. It has a criss cross detail on the neckline, which makes it a little different than other black sweaters. This was my one accessory item. It’s a gold necklace with 2 chains and 2 bars. Definitely a simple necklace that’s pretty versatile. This skinny jean is buttery soft and super comfortable. The color is totally on trend this season and can transition easily to next Spring. I found the entire process to be fun! People don’t usually give me gifts so I was actually excited to not know what was in my box. After it arrived, I waited until the kids were out of the house before I opened it so the box would have my full attention. Opening it really felt like unwrapping a gift from a stylish friend who has your best interests in mind! 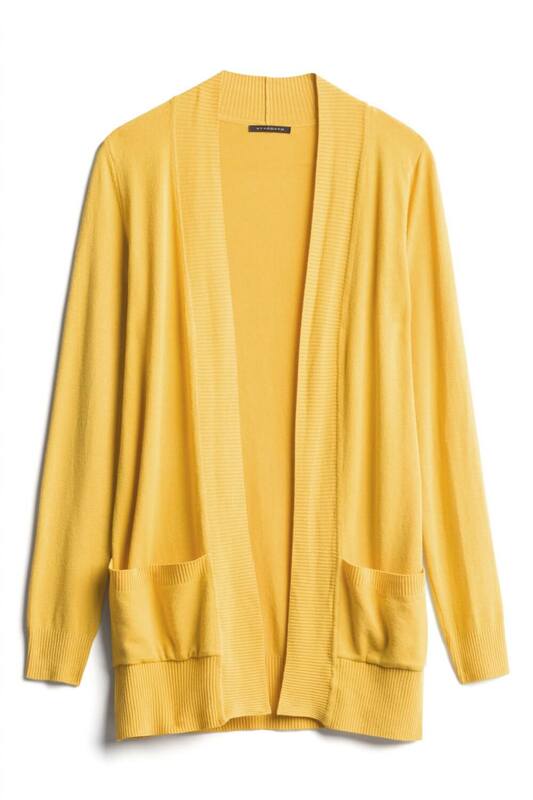 I genuinely love the mustard yellow sweater and the striped shirt. These are items that I would have immediately grabbed in a store to try on. The black sweater and the gold necklace were just okay for me. Nothing was wrong with them and they were definitely in my style range. They just didn’t wow me. Overall, this was a really positive experience. The items I’m keeping really do bring me joy and I know they will be in heavy rotation all Winter and Spring! I’m excited to see what’s in my next box! Wonderful choice indeed and it saves the nuance of the mall. But the best part is “Once it arrives, you have 3 days to try everything on and decide which items you love and want to keep. 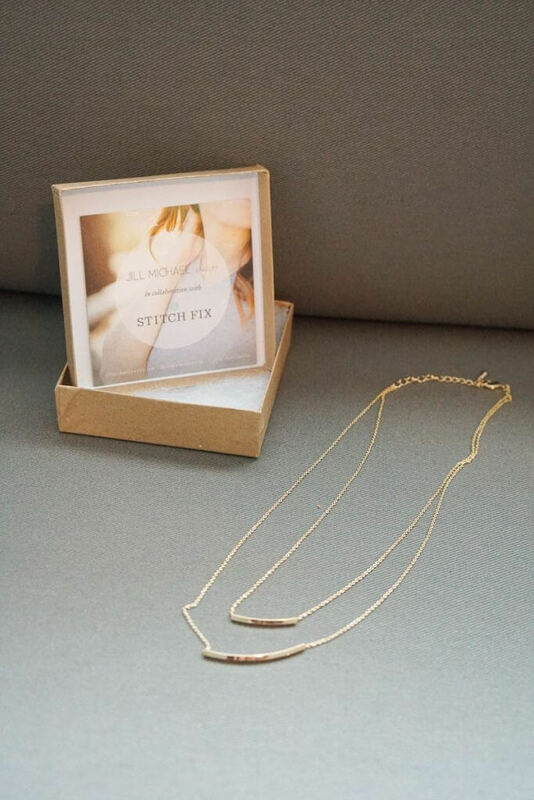 Then, put the rest back in the box and ship it back to Stitch Fix.” I mean this is new for the online shopping part. Great. I wish something similar soon starts off in India too. I hope India gets something like Stitch Fix, too! This definitely seems like the way to go for busy Moms and others who dislike goinginto stores and trying items on (ME). I do love that striped polo and sweater and they can be dressed up or down! I was so excited with the items I chose to keep! Definitely great for people who don’t enjoy shopping! This looks like a great platform that can help a busy mom like me. I love how useful this site is. I’ll have to give it a try. Check it out and hopefully it will save you some time! I loved reading it from your point of view. I was not pleased with my past experience. Since then I’ve tried it several more times hoping something would change, and it never did… Until today, when my Fix arrived and I loved everything they sent me! I think it’s totally trial and error until they understand the stuff you really like! That’s why I’ve been doing the thumbs up/thumbs down thing on their site everyday to help pinpoint my style! This was really cool to read, Marcie. I had been wondering what the experience is like with this – and honestly with any of the other “they pick things for me” subscription boxes. You made it sound very fun. Yes, the whole experience is pretty entertaining and exciting for me! Looks like you got a great box of pieces! I could definitely see myself wearing that sweater to work! I didn’t know there was a stich fix for kids. That sounds awesome! Yes, they just rolled it out this year! Those are all really cute pieces that came in your box! I’d like the necklace. It’s such a versatile piece of jewelry. The sweater seems really cozy, and the striped shirt is fun and casual. Seems like this box is full of keepers! Definitely a great first box! 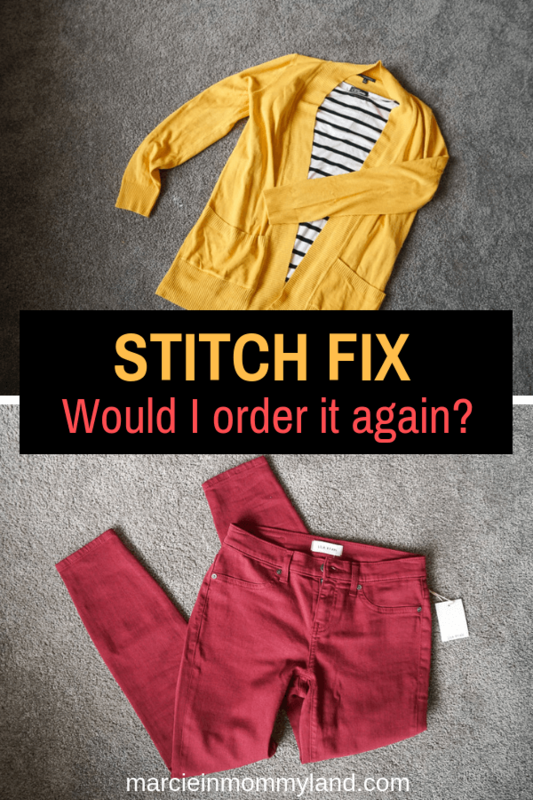 I have used Stitch Fix and really enjoyed it. They were especially good at finding pants that fit me perfectly, which so rarely can do on my own! I was shocked how well those pants fit! Thanks for explaining how it works because I have heard of Stitch Fix but didn’t understand how it works. I love my FabFitFun Box for the same reason that it is like getting a Christmas gift to myself every time. I am going to have to see if this box comes to Canada. Yes! It’s such a fun surprise in the mail! I have heard such great things about stitch fix! I’m also a busy mom and could really use this in my life! It’s a great way to treat your self! Great review!! I’ve always been curious about StitchFix. Personally I LOVE shopping so I don’t think it would be right for me but myn mom on the other hand…..this could be perfect for her! I also LOVE shopping, which is why I didn’t do it before. But, with my little kids, it’s harder and harder to go so I like that I can bring the shopping experience home! My mom is a HUGE fan of Stick Fix and I actually just signed up! Can’t wait to get my first box! Oh yay! Hope you enjoy it too! Seems to be an interesting concept. Would love to try it out. So glad you had a good experience – you got some fun pieces! I have been doing Stitch Fix every month just because I love seeing the options that they would pick out for me & it gets me out of my comfort zone of what I would normally pick. So fun to see what comes in each box for others, too! Yes! I need to get out of my comfort zone so I’m excited to get dressed in the morning. I need all the encouragement to get ready for the day!